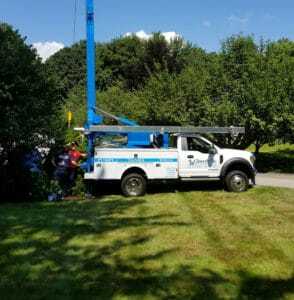 Water Pump Installation Bedford Hills NY | Water Pump Service Bedford Hills | Well Pump Repair Bedford Hills | Churyk Company, Inc.
We provide complete pump installation, replacement and service. We install only the highest quality, most reliable pumps from manufacturers including Franklin Electric and Goulds pumps. If your pump needs replacing – we can usually do it the same day. We work on older style jet pumps, conventional well pumps, variable speed well pumps and irrigation pumps. We have a vast inventory of all different types and sizes of pumps ready for any emergency situation that may arise. We install booster pumps for homes with city water. When city water pressure is not acceptable, we install ultra quiet booster pumps to correct this. We specialize in residential submersible pump replacement, jet to submersible pump conversions, variable speed pump installations and booster pump installation. We have vans equipped with portable pump pullers as well as crane trucks capable of pulling pumps in excess of 1000 feet or more. Whatever your water pump needs are, we can offer a quality and reliable solution to meet any demand. All our pumps and systems come with a five (5) year manufacturer’s warranty and we guarantee all our workmanship for one full year.